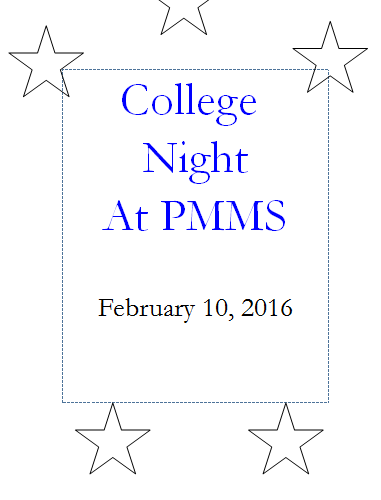 Please join us at Perry Meridian Middle School for College Night on Wednesday, February 10, 2016, from 6:00 – 8:00 p.m. – Doors open at 5:30 p.m. to eat and to visit tables. Students & Parents are welcome. 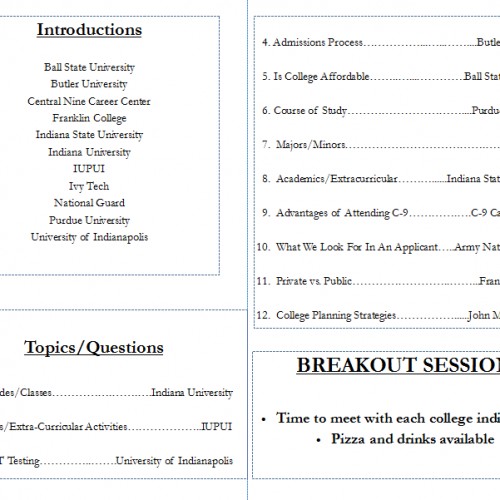 Colleges attending include: Ball State, Butler, Franklin College, Indiana University, Indiana State, IUPUI, Ivy Tech, Purdue and University of Indianapolis. A representative from Army National Guard and C-9 Career Center will also be in attendance. There will be a question and answer forum that includes all of the colleges as well as time to visit each representative at their assigned table for any specific questions. Doors open at 5:30 p.m. and refreshments will be served at this time. College presentations will start promptly at 6:00 p.m.